Crownstone | Watch out with wiring in your home! The Crownstone is able to cope with very high currents. This however does not mean that you should try to use it in that setting. Although the Crownstones themselves might be able to cope with this for quite some time - until the thermal fuse kicks in - the wiring in your house, might be suboptimal. In the red circles you see black stuff: charcoaled plastic. Needless to say that these prongs pose a fire hazard and I shouldn’t have used this electric heater to begin with. 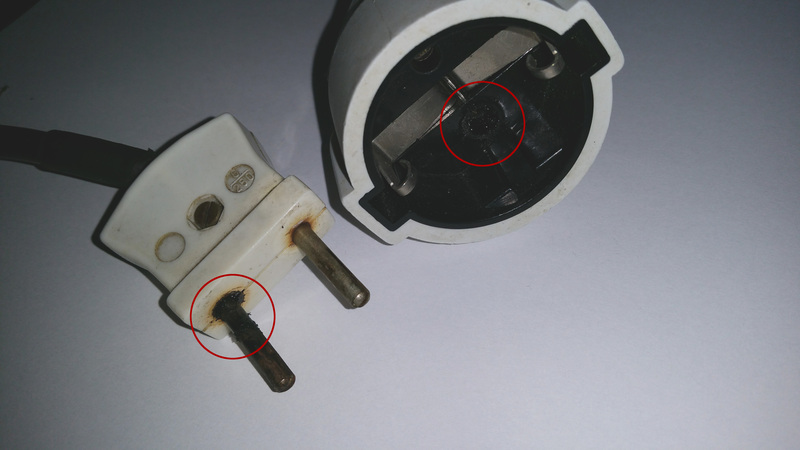 However, I did this experiment on purpose, because it is both (1) a nice testimony to the robustness of the builtin Crownstones and (2) a fair warning to people to use common sense with household appliances. With Crownstones we are one step closer to safer homes!